I started writing my flash fiction submission for Write..Edit..Publish October prompt with a repetition scene. Good thing I checked the true meaning for Deja Vu. According to Urban Dictionary, Deja Vu is: Something that very few people know the true meaning of. Even though deja vu is French for "already seen", it actually is used to describe the strange feeling you get when you're in a situation, and feel like you've been in the exact same situation before, but really haven't. Most people think it means the same thing happening twice, which is wrong. Get it right people! OK, rewrite; hopefully I "get it right" this time. I also looked up info on VooDoo (or Vodou as it is more appropriately spelled) but just did not have the time to develop that level of a story. 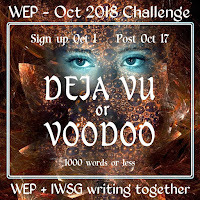 Anyway, there are lots and lots of people signed up on the WEP+IWSG linky, so if you are a fast writer, you can still submit for a day or two, or just go and read what others have written for this prompt. Below is my submission. 978 words, full critique acceptable, hope you like Viking Gods. “We’ve been here already,” Thor lamented as he bashed Mjolnir against a stone wall blocking their progress through the labyrinth. “I got this,” Thor growled, though his impatience to get to the feast was quickly outdistancing his pride. Freyr was not happy about the journey to visit their father, Njord, at his giantess wife’s snowy home. The summons left him surly, wishing he had Thor’s hammer to bash in a few walls himself. He despises any travel that does not rely on his boars, or his ship. The only light in the situation was the thought of the wedding feast, and all the associated revelries. His sudden smile at the thought brightened the corridors of the labyrinth. Thor’s bottomless stomach rumbled as if in response to Freyr’s thoughts. As he raised his hammer to strike the fiercest blow yet, Freya touched his arm to gentle his anger. “The what?” Thor leaped around to face the wide corridor behind them, Mjolnir braced to defeat any threat. Aegir looked to Ran, who shrugged. “Some old battle mound a short distance from Skadi’s fortress. We needed them traveling in the correct direction to allay their suspicions. It is said the dead here are restless.” She withdrew her magical net and smiled at her own cleverness. “One more blow from Mjolnir and that wall will collapse. The dead will push them through the next segment atop the frozen lake. Freyr will naturally unfold his ship and,” she spun the net above their heads and watched it grow. The dead had indeed risen from the ground in a blood thirsty rush; shouting battle cries for one Lord or another, swearing vengeance at Ragnarök for the deaths of their brothers. Many more were emerging in a shambling mass from the thick stone walls as if the barriers that withstood Thor’s hammer blows were insubstantial. “Yes!” Thor roared, a smile of intense pleasure cutting a gash through his red beard. Lightning flared and flashed. He maintained his battle stance protectively in front of Freyr, as lightning flashed from Mjolnir, his golden grieves reflecting ghostly lights from battered helms, breast plates, shields, swords, and battle axes. “Be still,” Freya admonished testily, raising her arms in invitation to the advancing horde. Thor lowered his hammer instantly, his battle rage fleeing as quickly as it had flared. No one could remain hostile under Freyr’s will. The savage spirits of the warriors also calmed, their battle cries turning to boasts of valor as Freya held court. Still watching from outside the scrying globe, Loki swept his burning gaze up to Ran and Aegir, who stumbled back at the searing intensity of Loki’s wrath. “Besides, they are still moving in the right direction. We did not expect Thor, but it will be fun to watch him melt the ice with a bolt from Mjolnir.” Ran had not put away her net and seemed as unconcerned as Aegir regarding Loki’s distress. Loki pointed a finger at the globe. “And what do you see happening down there now?” Green venom dripped from his fingertips, causing fissures in the globe’s surface. The giants stared down at the now quiet corridor. Freya seemed to glow as she listened to each warrior in turn. She sorted them in three groups, the spirits in the largest group fading and losing their shape as Freya’s attention focused on the two smaller groups. “What is she doing?” Ran cried, dropping her net as she tried to see through the cracks in the globe. “Oh,” Ran and Aegir stated lamely. Loki, Aegir and Ran were all thrown to the floor as the scrying globe exploded. When the dust settled and the three were able to pick themselves up, Thor, Freyr and Freya were glaring at them. Aegir and Ran vigorously nodded. Ran tugged at her net less than inconspicuously. Freyr pretended not to notice, smiling through the awkwardness. Freya’s attention was still on her conquests. “So, what brings you here Thor?” As he spoke Loki’s raiment was subtly changing from his dark armor to wedding finery. Thor’s stomach growled again and the issue was settled. How did you like September? The cooler days in NorCal were refreshing; Fall is my favorite season, and we got just a taste through September. October should be much better. Its my birthday month after all. And Halloween. I love Halloween, but I'm no longer a fan of Trick-or-Treating; too dangerous for kids now days. Never know what people might put in candy, or who might be bringing a real machine gun to the party, or if some one will take the car and plow through the hordes on the streets. All the fun things about Fall - harvest festivals, street markets, community clean ups - are laced with scary anticipation. Can't let a little fear stop the good things in life. Right? If you stop by my house on Halloween, you WILL get candy. Unless I run out before you get here. October is also the last month I blog for the year. Although this year, I seem to have only blogged for IWSG. Every year I go off-line for two months to write, and usually get very little done. I hope this year is different!! Because October is my favorite month, I'm co-hosting IWSG with Christopher D. Votey, Tanya Miranda, and Chemist Ken. And Alex, of course. October 3 optional question - How do major life events affect your writing? Has writing ever helped you through something? That's a heavy question. Appropriate for me just now though . . . I lost my job on Aug 31. The company decided outsourcing Reps would be cheaper than paying their own, and the new company decided not to hire any former employees. So, I've been home for about six weeks. Great time to get a whole lot of writing done! There's the 2018 IWSG Anthology contest, WEP October prompt, several unfinished short stories to complete for submission next year, the Women's Fiction trilogy to work on. No shortage of writing projects. Yet, I've barely worked on anything. I started writing seriously in 2005 when I was fired from a job. And yes, it helped me get through one of he most horrific periods of my life. Immersing myself in that fictional world helped me escape from all the problems and pressures of being an unemployed single mom. Luckily, I had not yet gotten used to being on my own, taking care of my own life, and there were people to help me (rescue me) get back on my feet. Over the last 15 years however, I have grown up and learned to handle my own life, and all its problems. I was devastated when I lost my job five years ago, and it was difficult to write. But I did. I had an income still, things were not as desperate as it felt. This time there is no income and reality has hit me so hard I can't immerse in fictional fantasies. With any other life changing event - death, divorce, disability - I think I could write through them. It would help to work through the emotions. Writing, and cleaning, lol. I do my best house cleaning while under stress. Cleaning helps me think clearly; seeing the completed task boosts my self confidence; confidence leads to better job search; and as my mind wanders, it always circles back to my unfinished writing projects. And then, I can write!! Don't get too worried about me; I did find another job. Doing the same thing basically with a rival company that is growing and expanding, not cutting expenses. I start next week. I think I will like it. Which means I should be able to get some writing projects done (fingers crossed). I'm working on my IWSG Anthology submission, but I have no YA voice. None. Guess I better work on the WEP flash challenge instead. The WEP sign up linky is open now. Do you write through your major life changes? Or get stifled until its all over like me? P.S: Ugh, my virus program is blocking just about every blog I visit. Sorry if I'm a bit late in commenting here and at your site: I'm battling the blocks.